Days after naming Slash its first ever Global Brand Ambassador, Gibson has confirmed the release of the first of what will apparently be several new Slash signature models: a Custom Shop Les Paul in an "Anaconda Burst" finish. This guitar will be sold in both flame top and plain top varieties, with a limited run signed by the Guns N' Roses guitarist himself. The prototype for this model has apparently been in Slash's hands for some time, as photos of him playing it on stage have been floating around the internet for a year or so. 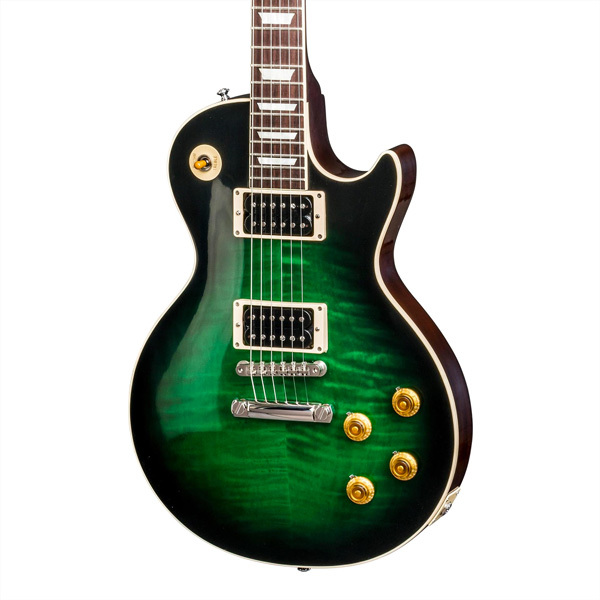 The guitar is a variant of Gibson's R9 model, which is a high–end reissue of the classic 1959 Les Paul. This particular version includes Seymour Duncan Slash APH pickups as well as a unique neck profile custom–built to Slash's specs. While this Custom Shop guitar comes in at the very top of Gibson's price range, we expect more affordable Gibson and Epiphone versions to make their way to market soon. Until then, let us know what you think of this vibrant new finish in the comments below.